...….. Yes, it really could get a lot worse here. And for reasons that you are not being told. ……..
Mod: My tolerance for this sort of thing is way down lately. Not that it was ever all that elevated, mind you. On Wednesday of this week, in the very 210 Freeway-centric San Gabriel Valley Tribune, three of the lesser leadership lights in this smoggy valley cranked up their noise machine and came up with some remarkably indistinct arguments for going forward with the 710 Tunnel. Something that most people here don't want, and will worsen our quality of life. They called their guest commentary "Clearing the air on SR 710 North" (link), and it was written by Gary Toebben, Hilary Norton and Cynthia Kurtz. A hat trick of suspect commentators, and all people who have been hustling a living on the local government/bureaucracy circuit for a while now. There are a lot of these kinds of folks floating around the neighborhood while you're off working. So many in fact that they write their opinion pieces three bureaucrats at a time. I thought I would discuss a couple of the more remarkable nonsense passages from their article, and then share with you what I believe really is hurling the Metro-Caltrans juggernaut towards a tunnel they have been hellbent on building all the while. No matter what the ginned up PR justifications for their so-called "process." 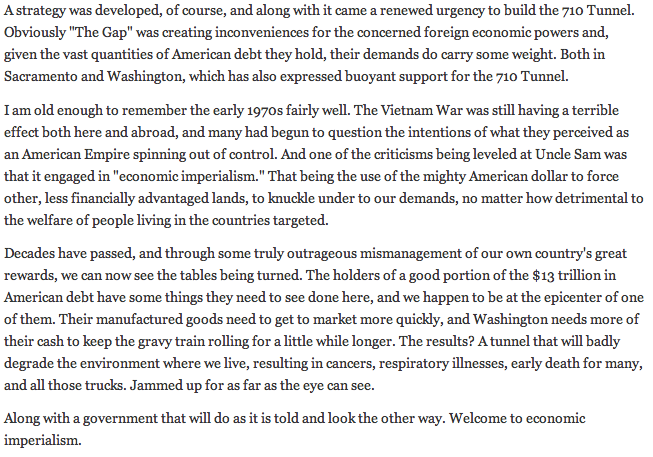 First, when the authors are talking about "The Gap," they are not discussing any local mall clothing store. They are talking about that part of the 710 Freeway where they plan on putting a tunnel connecting the heavily polluted 710 Corridor to the portion of the planet where we live. A place called the San Gabriel Valley. All of the health statistics they cite here will become even more a part of our world as vast volumes of additional diesel truck and auto traffic are funneled onto the 210 Freeway, a thoroughfare that already is a nightmare for those using it to commute back and forth to work. The Los Angeles County Economic Development Corporation is also amusing, in a pliable nonsense numbers kind of way. Can you name all of the local business nonprofits and government bureaucracies that specialize in predicting the future? In order to justify certain agendas, along with their corporate and taxpayer funding? There are so many. And based on the track record you'd be better off going to a palm reader. None of this makes much sense of course, especially for those who live in the area covered by the newspaper that published their views. The San Gabriel Valley already comes to a near standstill twice each day. What happens when there is a direct route from the 710, 5 and 10 freeways straight onto the 210 freeway? Chaos, obviously. That so-called "congestion solution" they have been pushing from the start, this 710 Tunnel, will mean little appreciable difference in the areas they claim to care about, while at the same time making the congestion here far worse than it is already. And how strange that Cynthia Kurtz, who works for an organization called the San Gabriel Valley Economic Partnership, should be pushing for this. Should the 710 Tunnel ever be built few of those esteemed local leaders of commerce will be able to make it to their frequent SGVEP meetings on time. So what is the real reason for building this 710 Tunnel? In January of 2013 I wrote a guest commentary of my own for the San Gabriel Valley Tribune. It was called "Economic Imperialism and the 710 Tunnel" (click here). In my humble opinion these are the real reasons why compliant lifer bureaucrats like the authors of the baloney cited above are scampering about pimping their tunnel deal. And in ways that have little to do with the what is actually going on. It is kind of sad, and even a little frightening. So many of those we trust to run our local governments, planning organizations and regional transportation agencies such as Metro and Caltrans, have actively involved themselves in promoting the interests of less than friendly overseas economic interests. And at our expense. From getting cheaply produced foreign manufactured products out of the ports and to market more quickly, to enabling McMansions in Arcadia. Quite obviously our unctuous bureaucratic functionaries have sold us out. Apparently in their eyes the deals are done, plans made, and we the people have become little more than a public relations problem. Folks not worthy of being told much actual truth, and as such something to be mishandled with care. At least until all of the geopolitical global power changes and required infrastructure are in place and running. After that we won't matter. These folks are no different than the politicos in South Pasadena. They are in power and they will do what they want and the people be damned. Many of them are not really in power. They apply for and land jobs that assist in feeding their egos so they think they... have power and influence. Doesn't make them smart. As has been said here before, most smart people are out there trying to do smart things (like work for companies that will fire them quickly for lack of performance), and politicians are out there... feeding their egos, by any means necessary. They're just a facade. The real work is done behind the scenes, safely out of sight. I was going to say who elected them to be the voice of government, but then those we do elect aren't that much better. Our pay to play Assemblyman Chris Holden is a tunnel lover. Holden has to be a tunnel lover. The Unions that gave him hundreds of thousands of campaign $$ demand it. In case you recognize the name, Lance Williams is also the guy that dropped the dime on our very own Susan Henderson. Her fall from grace as the #2 Democratic Party employee in the '90s is quite a story. The United States is far less democratic than it claims. I'm glad we don't get all the government we pay for." We the people now work for the government! In the City of Sierra Madre, we pay the highest User Utility Tax, have the Highest Health Care Cost for City Employees in the state, pay a high salary to the City Manager and her department heads, not to mention the Community Redevelopment Agency that no longer exists but still pays salaries to the City Manager and staff. Arcadia CC voted against High Oaks Homeowners Asso. to allow mega mansions (6500+/- sq ft) to go in at addresses on E Orange Grove and Highland Oaks. See link to article in Preserve Sierra Madre. We have to be sure we have regulations in place to prevent this. I was struck by the quote about how there had been many requests to turn down developments, and only one ever succeeded. I thought there was no resident resistance in Arcadia, at all. But apparently there has been. Clearly though the usual channels won't make an impact, and the residents will have to sue their city. I've never undrestood the way tunnel proponents admit the health hazards they have, and their desire to share them with us. Since they have no regard for the people they are talking at whatsoever, they just say whatever they think will sound good. 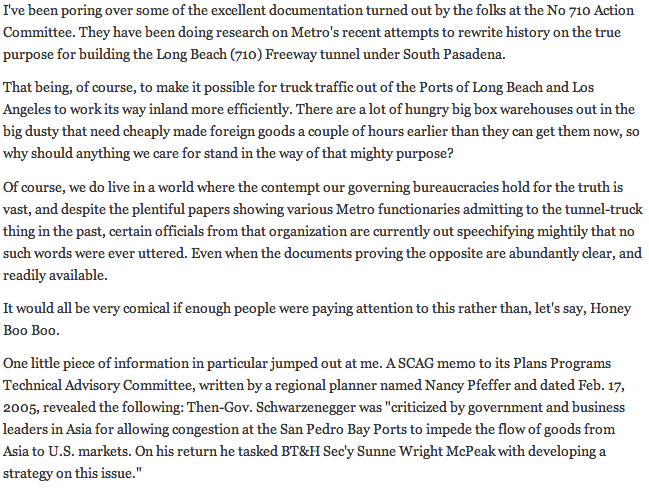 Their contempt for the people of the SGV is immense. I think it took them a while to even admit there were serious health problems. And guess where they would be the worst, according to their own studies? At the mouths of the tunnels. So goodbye any property values people who live around there have. Yeah, it's kinda like "We have this terrible problem, and we want you to have it, too." In Los Angeles County that is what is known as being fair. Shared cancer risk is equality. Equal misery under the law. What I don't get it the lack of insight that political leaders seem to suffer from. How is it that they don't see that their vote on each and every issue also affects them, their families--wives/husbands/children/neighbors/neighborhoods. All this overdeleopment has direct consequences. It is an absolute falsehood to refer to them as unintended consequenes. The consequenes are well known and long lasting and degrating of neighborhoods, communites and the environment. A lot of them are corrupt. My guess is most of Arcadia's City Council has received financial benefits from developers and that horrid real estate organization in town. I just don't see any hope for Arcadia, but maybe I'm being pessimistic. I don't see much hope in anything around here, but what the hell. Let's fight the bastards anyway. I hear the bureaucrats are trying to resurrect Measure J again. Vote No. They'll just use the money for the tunnel. Measure J is just a way to tap into the wallets of the affluent areas to dump $$ in LA City and other impacted areas. Redistribution, in other words. If you people are pissed off, I'm happy! Scrape it, rake it and stake it....LETS GO!!! It is a pleasure to bring joy into a life that obviously has so little of it. Don't look now 10:10, but your crankcase is leaking fluid. 10:10, great summation of the pro-over-development mentality. Just perfectly expressed. It's amazing that the earth tolerates that attitude at all. I'm not sure it is, 11:00. 10:10, there are anger management groups that can help you. 10:10 cleaned up the language of the saying for us. Had to pick up something in Commerce the other day and the truck traffic on the 710 was horrendous. I can't even imagine what it would be if the tunnel was constructed. Breathing Uneasy: Living Along the 710 Freeway Corridor: Angelo Logan remembers growing up playing baseball in his neighborhood park as semi-trucks grumbled overhead, dropping plumes of exhaust onto the field. A Commerce native, he would ride bikes with his friends up and down the congested streets and "navigate among the big rigs." For him, the harsh health impacts of living along the freeway were an everyday reality. "At a particular time there was a slew of cancer on the street I lived on. We called it Cancer Alley," said Logan, who lives in Long Beach along the 18-mile stretch of the 710 corridor. "And on this street it was constantly, 'Oh did you hear? This person has been diagnosed with cancer. This person passed away from cancer.' And some of these people had never smoked a day in their lives." I think they're trying to kill us. "Toward the end of the meeting, though, things took a personal turn as allegations suggesting a conflict of interest were aimed at two officials for taking campaign contributions from developers and local design agencies. Councilmembers redirected conversation to the projects, and told residents it was not the time nor place to bring those matters up. Kruckeberg agreed it was a very “contentious” meeting, one that was fueled by emotions on both sides." If any one has any solid information on these contributions and wants to get in touch with me, I would be happy to post that information on this site. Thanks. E-mail me at sierramadretattler@gmail.com If you could include a phone # that would be great. running for the Sierra Madre seat on the PUSD board is Sandra Siraganian and Lawrence Torres. You may recognize the name Torres. Lawrence is the brother-n-law of former Sierra Madre council member Tanja Torres. Small world! Then I'm voting for Sandra Siriganian! That Torres would do to the PUSD what another Torres did to One Carter. Let's hear from the candidates at the candidates forum. Oh, that's right - Saraganian didn't show up. Considering the tidal wave of slander coming from the vastly corrupt LA County political machine, can you blame her? Hey, 3:09. There is a bribe waiting for you in Memorial Park. Go get it! I forgot to tell you, 3:09. My dog delivered it. No posts allowed unles they support Siriganian. Considering the damage the Torres family has done to this town, are you surprised? Lotsa luck with the preservationist vote, 4:03! Taken the One Carter tour yet? Why are the Torres people baiting The Tattler? I haven't said anything about this election. Peter Dreier? Oh, that isn't good. Explains the smear tactics of the Torres campaign. Has Joe Mosca come out of hiding? Peter Dreier, eh? Now that does make for an interesting ideological spread. The quite conservative Ms. Siraganian versus the communist backed Mr. Torres. Not bad for a Board of Education election.